If you haven’t made homemade jam yet, you NEED to jump on the bandwagon! Trust me, I was once feeling the way you are… “It’s too hard.” “It is too time consuming.”…. But let me tell you… It is EXTREMELY EASY! And well worth it! Be sure and check out No-Cook Strawberry Jam for that yummy recipe! Summertime comes, and I am always stocking up on homemade jam so I have enough to last me until the following year. Nothing beats homemade, nothing! I made a batch of some Strawberry Peach jam and it is definitely my favorite! This recipe comes from MCP Premium Fruit Pectin and is absolutely AMAZING! These two flavors combine to make a perfect flavor combo! You need to try out this recipe! It is fantastic! 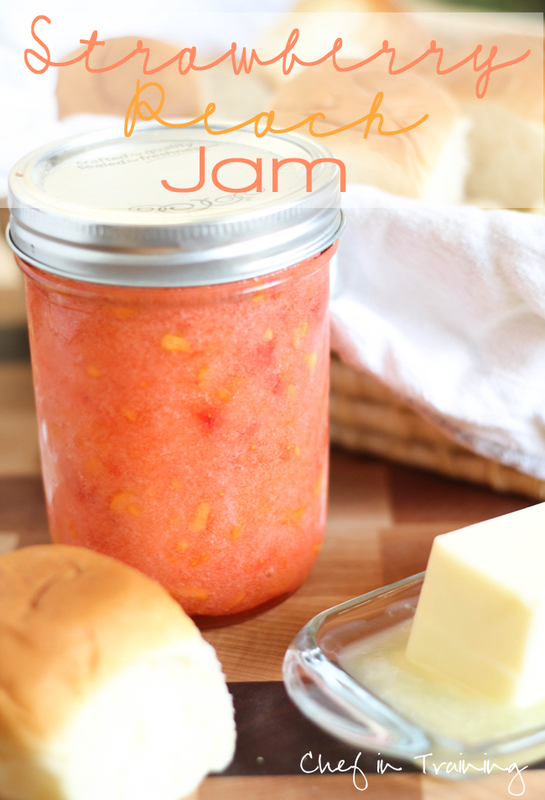 No-Cook Strawberry Peach Jam! This is an INCREDIBLE recipe! Mmmmm! Strawberry peach jam sounds so good. We just made plain strawberry jam to go with some bread we made, but I want to try your blend now too! This looks amazing, Nikki! I think it'd be great on a PBJ :) and confession time: I don't even like strawberry jam (I'm a grape girl!) but this looks so refreshing for summer. What's your recipe for your smoothie? Sounds yummy! Hi Nikki, this looks like a great recipe. And thanks for the wonderful cucumber dressing on eighteen 25's blog Nice to see recipies without dairy. I love making jams - but I wonder if there is a way to make this without corn syrup? If I processed it in a water bath, instead of making it a freezer jam, would that work? It looks yummy. You share the best stuff Nikki:-) I have never tried the freezer jam before...just the stove top version. This sounds much easier!!!! Hey Nikki! I love your blog! You're color scheme is way cute, and all your recepies looks so good! I wanted to say thanks for repinning my "20 favorite free fonts" post! A homemade jam that doesn't require cooking?! Must try! I've only made Strawberry Jam from the Sure-Jell type of pectin. Will this recipe work with sure-jell if I can't find MCP Pectin? This sounds fabulous! I love the strawberry/peach combination! Like you I've avoided making jam because of the time & mess but this recipe definitely sounds doable! I am so excited about this recipe. It is exactly what I needed to answer the "what do I do with all this fruit?" problem. I officially LOVE your blog! I made some frozen homemade strawberry jam this summer. I did reduece the amount of sugar becauseit was so sweet and we ended up with the most delicious Jam. I tmight have been more like a preserve as it was very fruity, and not quite as set as the jam I put full sugar it but it made the bes Pancake, waffel topping, great on rolls and it wasnt icky sweet. it actually had more strawberry flavor thatn the more sugar jars did. Made this tonight and so far so good. I do seem to be having an issue with the peaches floating though. Any suggestions? I've made strawberr6 freezer jam....and it was INSANE good! BUT....just wait until you try it with nectarines!!! I have the same question as Miranda (#8): Can this be done without corn syrup? I am trying to avoid corn products, but I thing this jam looks amazing! I made this recipe today except I made it with Ball's instant pectin. It only called for 2/3 c. sugar for every 1 2/3 c. fruit, so I feel like the sugar in this recipe is excessive. Is there a possible substitution for corn syrup? Thanks! I did everything right...only question I have is if I wanted to can them instead of freezing the jam, is it okay to not cook it? Or when canning do you have to cook the fruits down and remove the foam layer? I wasn't able to find the recipie- can you email it to me pretty please?? Thank you! Thanks for the amazing recipe! This jam is so delicious, not to mention very appealing to the eye! My oldest son recently made this for his Food Preservation project @ our local 4-H fair, and he won champion! He then took it to the Indiana State Fair, and it received a blue ribbon with a special merit award as well. He has never been more excited! Thanks so much!